For someone who hates being cold, I absolutely LOVE snow and will be quite happy out walking in it and even making snow angels (yes, even at my age!). So when the first snow fell in the Cairngorms I rapidly made plans at short notice for a couple of days away with the aim of getting a snow fix in the Cairngorms. From Perth, travelling north, we can be in Aviemore in about ninety minutes and although the A9 is not the most interesting road to drive, as a passenger it still is pretty and lots to admire. During the summer I travelled along this road more than I can (be bothered) to count; but yet during the winter it changes so much and now the trees have lost their leaves it exposes some sweet little houses that usually go un-noticed. And of course further north we go the more snow we were seeing! I think if we were better at packing lightly for a two night break then maybe we could get the train which goes straight into Aviemore. Sadly this is not one of our strong points. We arrive in sunny Aviemore around lunchtime and head straight for the Funicular Railway in the hope we would get some amazing views from Cairngorm mountain. The car park was heaving with families, couples and friends all out for a snow day and lots of dogs loving the snow almost as much as me. On the journey up we watched everyone having fun and making the most of the snow. The noise in the funicular carriage was heightened by excited children and the chatter of adults as we watched people skiing down the mountain. 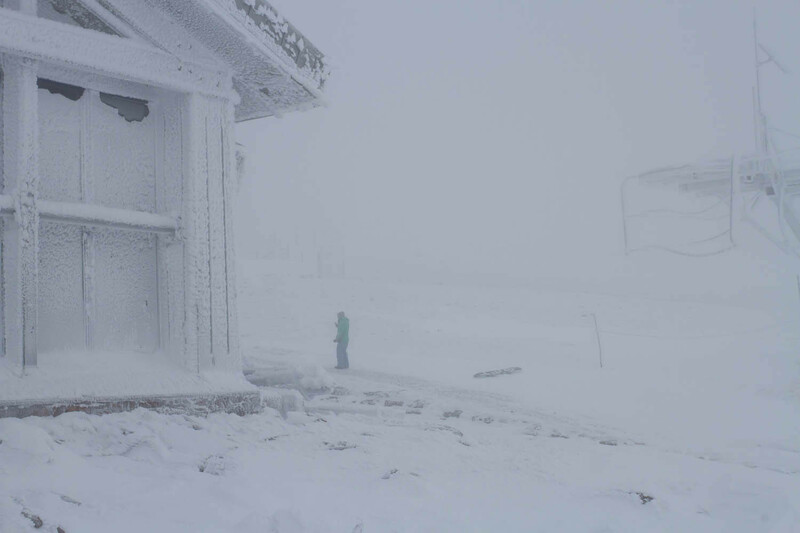 We were warned the temperature at the top on the viewing platform could be -17 with wind chill, they weren’t kidding! We were obviously wrapped up, layer upon layer but flippin’ heck that was cold. Oh and to add insult to injury, no view. Nothing. A complete white out but yet strangely beautiful. Happy that we had stuck around long enough to see something we made our way back down to the car and check in at the hotel. It’s surprisingly difficult to get a room in this winter playground but we managed to get one at the Hilton Coylumbridge for both nights. 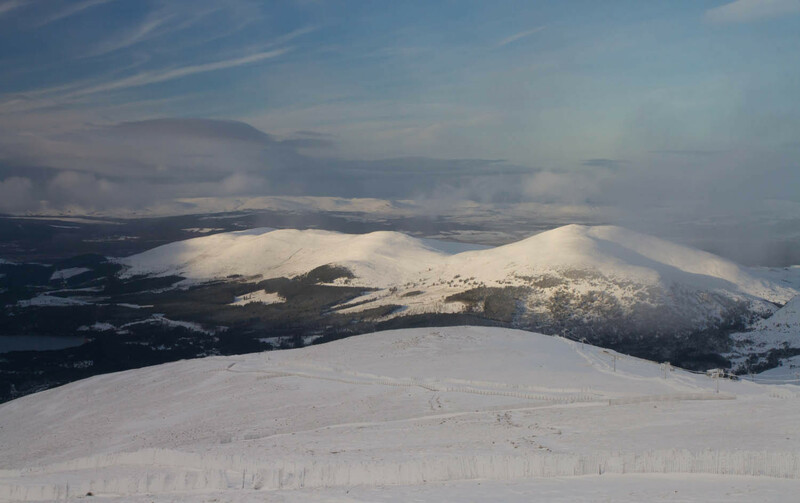 Located just a few miles out of Aviemore and right next to plenty of trails and walks and with plenty of other activities locally there is something to occupy everyone. I always struggle in hotel rooms because they are so warm and I am used to draughts and whistles down the chimney in our old gate house. I turned the heating practically off on the first night and put the window on the latch, allowing for some fresh air. This plan was thwarted by live music being played in the foyer of the hotel (of which we were practically right next to on the ground floor). Next morning after breakfast I mentioned the noise at the desk to be told “it only goes on until 22:30” but was offered another room for our second night at the opposite side of the hotel. Perfect. Needless to say it was still boiling but I was able to have the window open slightly and this helped. Oh and the view was much better, one of the woods rather than the car park. 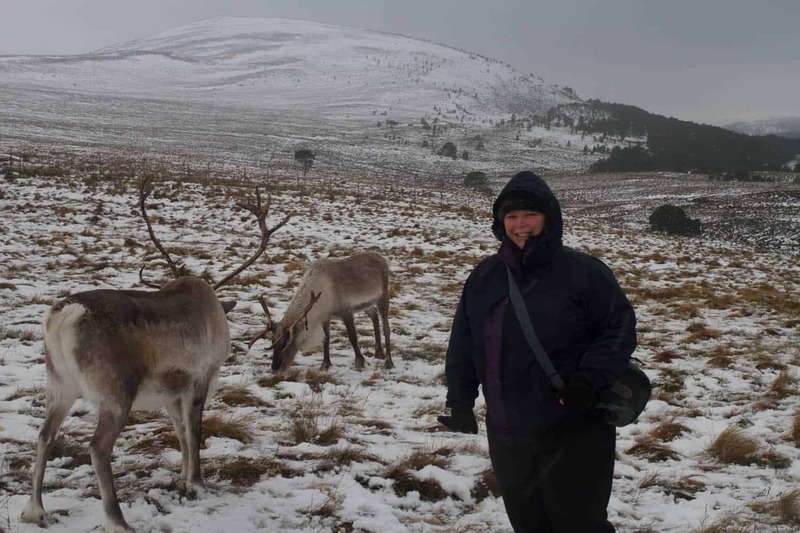 After sorting out the rooms we ventured out early into the cold to go just a few miles to the Cairngorm Reindeer Centre (inserts squeals of excitement here). After reading on the website that tickets cannot be bought in advance and that it is on a first come first served basis we were parked outside about forty minutes earlier that we needed to be! There was no way I was missing out on seeing reindeer today. Just before 10am we go into the centre to buy our tickets and secure our place on the 11am tour. Boom! We then go into the paddock area at the back of the centre where we see three reindeer. 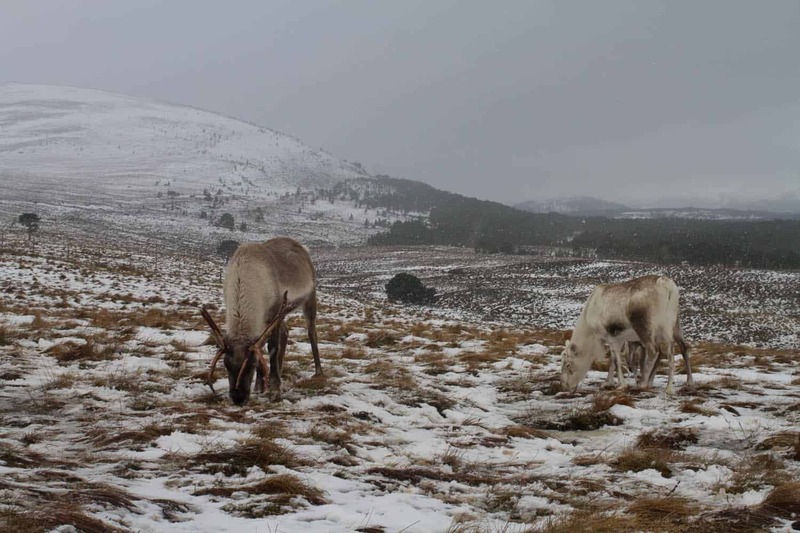 There is also a video narrated by Ewan McGregor about the Cairngorm reindeer and their habitat. 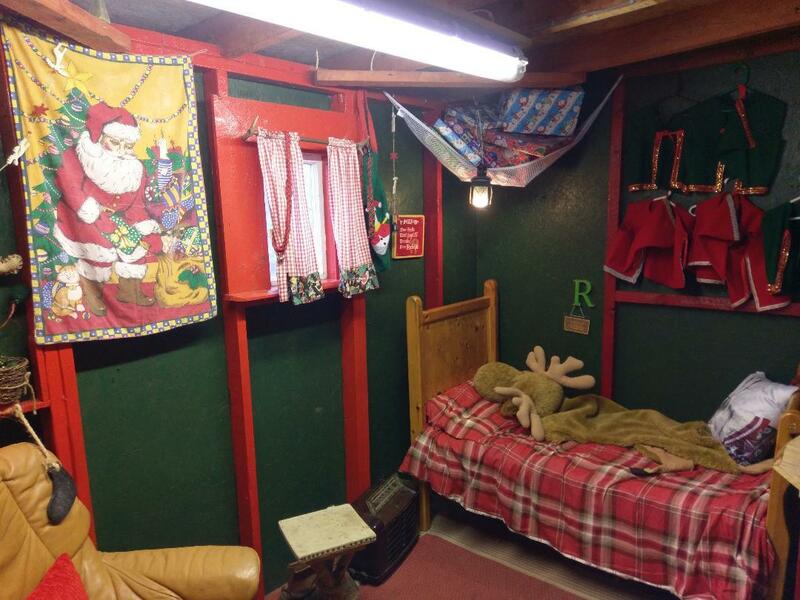 This is also where we get to see a replica of Santa’s office at the North Pole. One whole hour is a loooooooong time when you’re so excited! Anyway, with everyone that had bagged a spot on the tour now waiting in the car park, all wrapped up (some not so wrapped up! ), it started to snow! 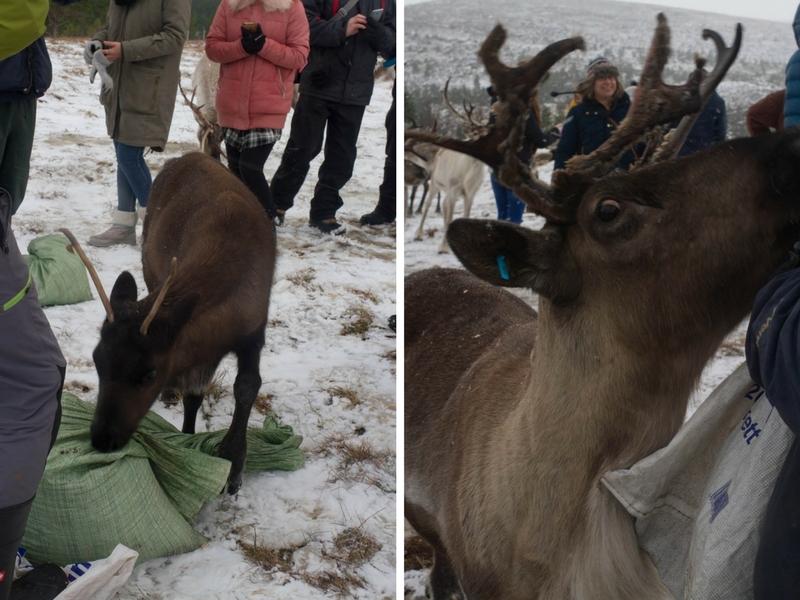 Once the reindeer herders arrived we were given a briefing of what to expect and how to treat the animals – not touching their faces and antlers etc, then we were off. There were twenty eight of us in the group, mostly adults but it is suitable for children too. People had also volunteered to carry sacks of food along the gravel path, across the bridge and up to the enclosure, making the most of the experience. 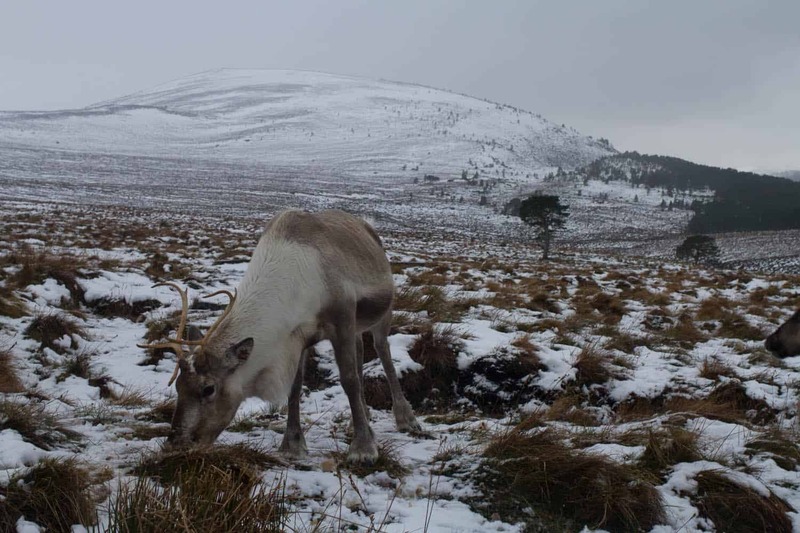 There around 150 reindeer in the herd which roam Cairngorm mountains and the Glenlivet Estate, some thirty miles down the road. This split makes disease prevention and breeding much easier to manage. 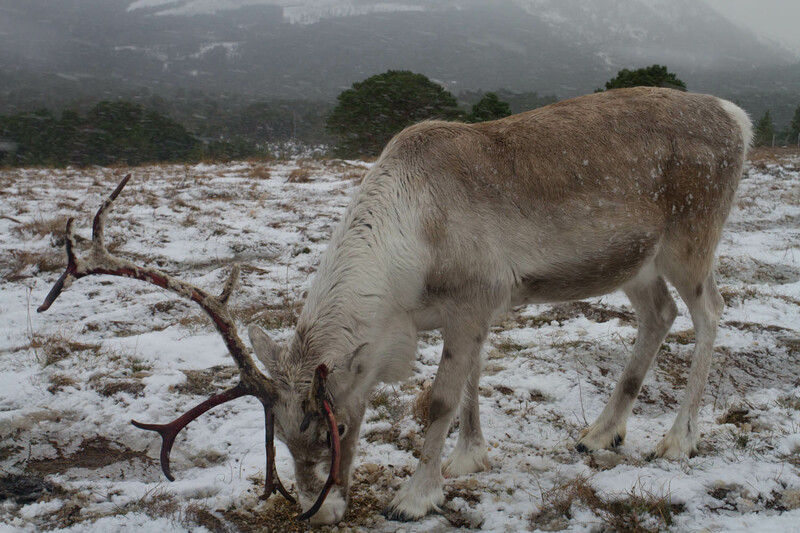 Some of the reindeer that freely roam the hillside are descendants of the original small herd brought over from Sweden in 1952. The 11am daily hill trips have been running since the late 1960’s with the herders getting to share their herd and knowledge with people like us. It was still snowing as we reached the top paddock and greeted by the first lot of furry noses as they know that this means feed time. Like lemmings we all file into the paddock and are followed across by the herd. We are introduced to some of the characters as they encircle us, waiting for food. Some are less patient than others! Then the food was laid out for them and we were free to take photos and admire these majestic creatures whilst they fed and walked in amongst us. Oh and the hand feeding! I thought I might just explode with pure joy! After the hand feeding people are free to leave or visit the females in the next paddock. Guess what? 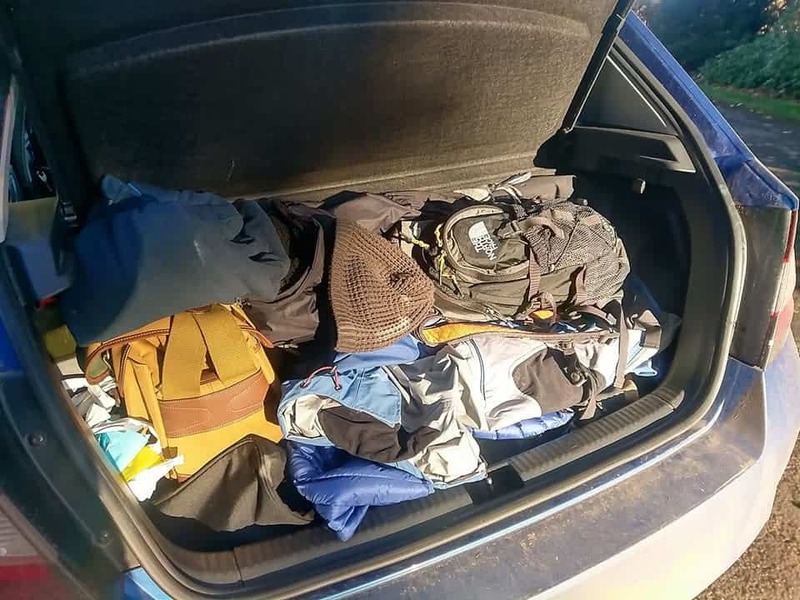 Yeah, we didn’t leave. Exactly the same process with the introductions, feeding, photos etc. The females were slightly more skittish and some of them were pregnant and due in the spring. I feel another visit coming on! 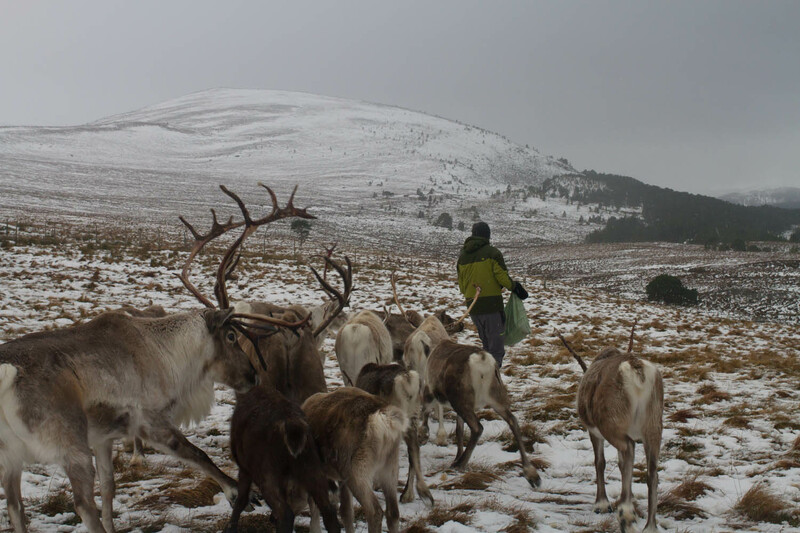 We spent the best part of an hour and a half up with the herd, learning more from the herders about the area and the history of the centre and how there came to be the UK’s only free roaming reindeer herd here in Scotland. I couldn’t have asked for a better day. The snow only added to the experience. Probably THE best snow fix in the Cairngorms I could have wished for. 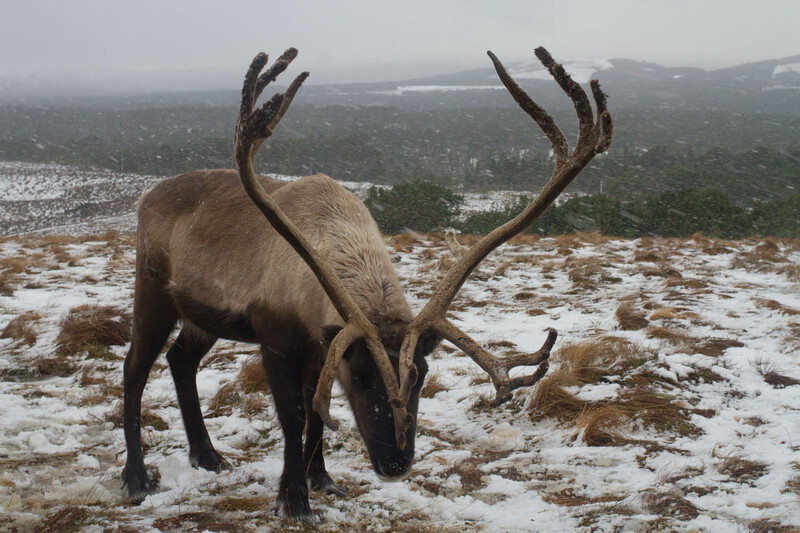 Of course, the whole area is a huge playground for winter sports and activities; skiing, boarding, walking, reindeer visits, Highland Wildlife Park is local too and open. All this and so much more. Ahh this sounds fabulous. I’m desperate to get to the Cairngorms, it looks so beautiful. 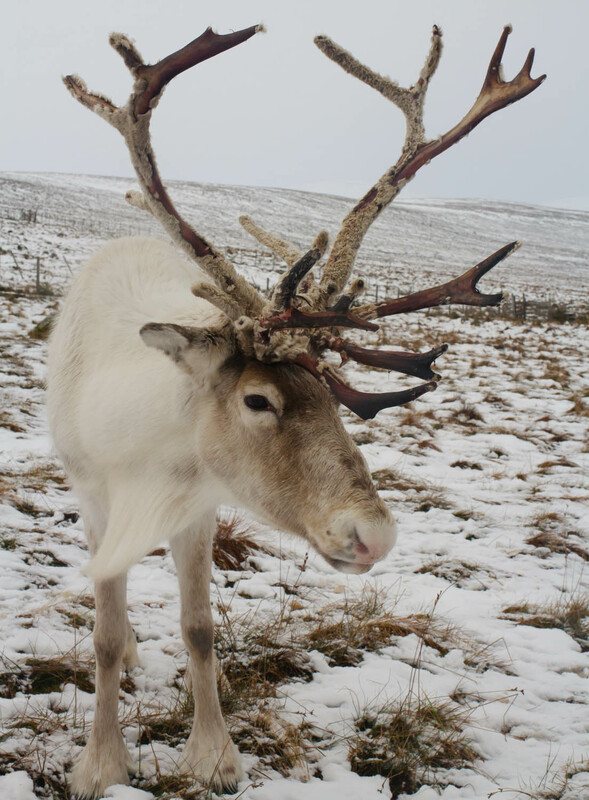 This is the ideal time of year to see the reindeer, we are loving the snow here! Pingback:	Is it too early to make a Christmas wishlist?